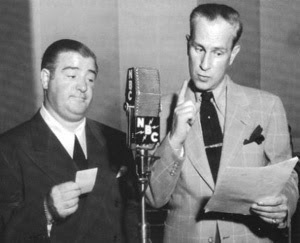 Here's an episode of the Abbott and Costello Radio Show from 1947. It's titled "Night In A Haunted House". The title tells it all. Enjoy! By the time The Empire Strikes Back had come out, the art of "customising" my store bought costumes had come to new heights. When I donned my Ben Cooper Yoda costume, I had a cane once owned by my great grandfather. This was no ordinary cane. It had decorative polish writing carved into it thus making it look like it could possibly belong to an aging jedi master. I think this was the last time I wore a store bought costume. It was fun while it lasted! Continuing with my posts about my store bought Halloween costumes, I bring you my only attempt at impersonating Robin Williams. I am, of course, talking about Mork from Ork. This was the start of my "customising" my costumes. I realised that Mork wore white gloves when he was in his spacesuit, so I borrowed my mother's crossing guard gloves and wore those as an added bonus! Thus I was more than just an average store bought wearing costumed kid! I was a one of a kind! Incidentally, I was at a vintage clothing store yesterday and they were selling the smock from the Ben Cooper C-3PO costume. Part of me wanted to buy it but the rational part of me said no. The rational side won. 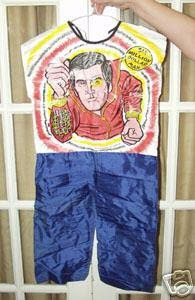 As we continue on with the countdown ( I suddenly had a flashback of Casey Kasem) I give you another great store bought Halloween costume that once adorned my little boyish body back in the day. This time around it's Steve Austin, aka The Six Million Dollar Man! I was a huge fan of TSMDM and still am to this day! (waiting patiently for the DVDS to be released someday!). 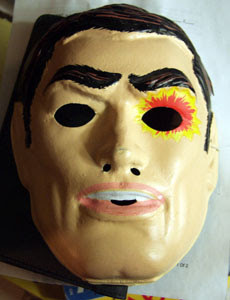 This was a cool costume because on the mask, it was very obvious to tell which eye was bionic and you kind of felt like you had a bionic eye because you were looking through an eye-hole cut out of a plastic mask! My mother still has a picture of me in this outfit with my sister in her outfit from when we marched in the town's Halloween Parade. I don't know if there were any other towns that did this, but in sunny Clinton, CT, they would have a Halloween Parade on a Saturday morning and all of the kids would march in costume where they were looked upon by the town. At the end you got a goodie bag of candy and treats like wax teeth and a statue of Dracula that had liquid in it. My father told me that the liquid was gross so I chose to leave the wax statue on my bourough until one day, in a fit of anger, I ripped the head off and then cried that I had ruined it. Good times! Speaking of the Six Million Dollar Man, in case you missed it, I posted the Power Records version of the series a while back. You can catch it here! 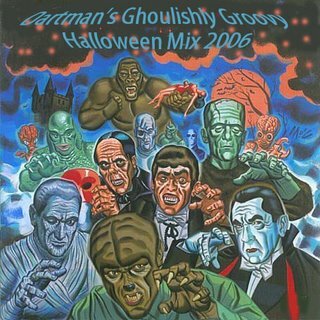 Here is my official Halloween mix from last year in case anyone missed it or doesn't have it. Featuring various spooks, shrieks and all around halloween goodness! It's in two parts due to the amount of tracks. Enjoy and stay tuned for this year's mix coming up real soon! When I was a kid, Halloween costume shopping consisted of going to the local Caldor store and walking through the Halloween section until you found the aisle with all of the costume boxes. Back then, costumes were made by three different companies: Ben Cooper, Collegeville and Halco. 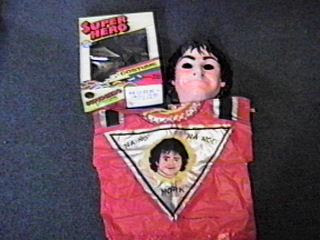 These costume boxes consisted of a vinyl smock that you would tie around your body and a plastic mask that had a rubberband to wrap around your face. When you walked, the vinyl smock would make sounds so loud you could hear them a mile away, and your face would sweat from the mask that you couldn't help but stick your tongue through the breathing hole at your mouth. Plus, with the mask on, all sounds you heard sounded like you were in a tin can and your voice seemed to be amplified to you but to no one else. The themes of the outfits were usually TV and movie characters but there were also generic ones like a witch or a ghost or somehting else. If you got to the store too late in the season you would have to settle for what was left that hadn't been picked over (more on that topic later). 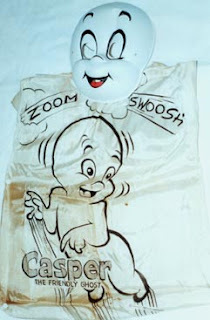 The first costume that I can remember owning was Casper. As you can see from the picture, the smock would feature a scene invloving the characters rather than an actual look-a-like outfit. As I was too young to actually remember wearing this particular outfit, I do remember owning the mask and wearing it for a few years after the initial halloween purchase. More to come on these great costumes of the past! 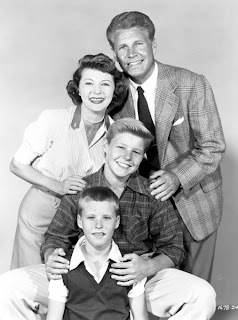 Continuing with our countdown to Halloween, here is an episode of The Ozzie And Harriet Radio show. The show is entitled, "Haunted House" and you can guess what the plot line is. Anyway, here it is for you now as an mp3 file! Enjoy! Today is October 1 and that means we have 30 days until Halloween!! 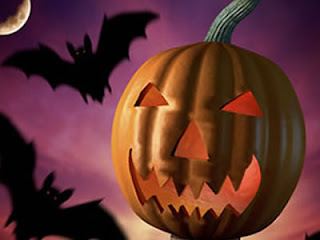 To do the just service of counting down the days until the spooktakular event, I will post nothing but spooky, fun Halloween-esque like posts all month long. 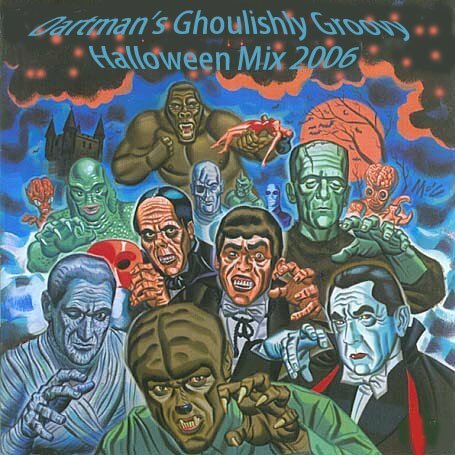 Of course there will be my Funtastic Halloween Mix for this year but that will come soon enough. Today I thought we would start out with some monsters! The Sesame Street Monsters to be exact! This album haunted me for years. Not because I was scared by it or anything (it is a Sesame Street record!) but because I couldn't have it. When I was a kid in grade school, every so often they would have a book fair in the library. They would have all sorts of cool things besides books. I remember they had magazines and records as well. Every year, the Sesame Street Monsters record would be there to buy and every year I would want it. However, I was under strict rules from my father that I could only buy books at the book fair and not records (even as a child I couldn't keep away from records!) As the years went by I forgot all about this album. And then I saw it in a thrift store one day and the memories came rushing back. Suprisingly, it was in excellent condition. So naturally I bought it and of course had to share it with you! Let's start the scary month of October off with "Sesame Street Monsters"! Enjoy!